UTC 2412-7H is an electrical converter designed to be part of a trailer built to North American commercial 7 pin standards. UTC 2412-7H enables its host trailer to be seamlessly coupled to either a NATO or North American trailer. UTC 2412-7H provides 6 independent circuits capable of supplying a total power of 800 Watts at 12 Volts. 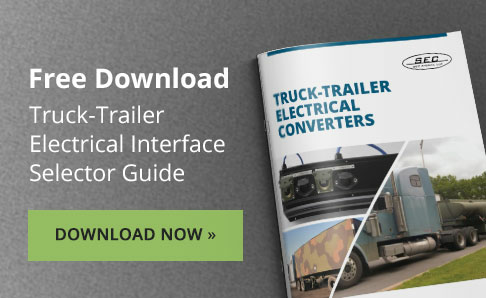 This power application to the trailer ABS system and its various lighting circuits is achieved through hard wiring. UTC 2412-7H is compact and lightweight at only 15 pounds. UTC 2412-7H has a flat profile making mounting practical to the front face of the trailer. Corrosion resistance tested per ASTM B 117. Although our stock models cover many trailer electrical interface requirements, SEC America, LLC will design and manufacture interfaces to custom and exacting specifications. Our experienced and qualified engineering staff is ready to match a design to specific physical and electrical requirements.